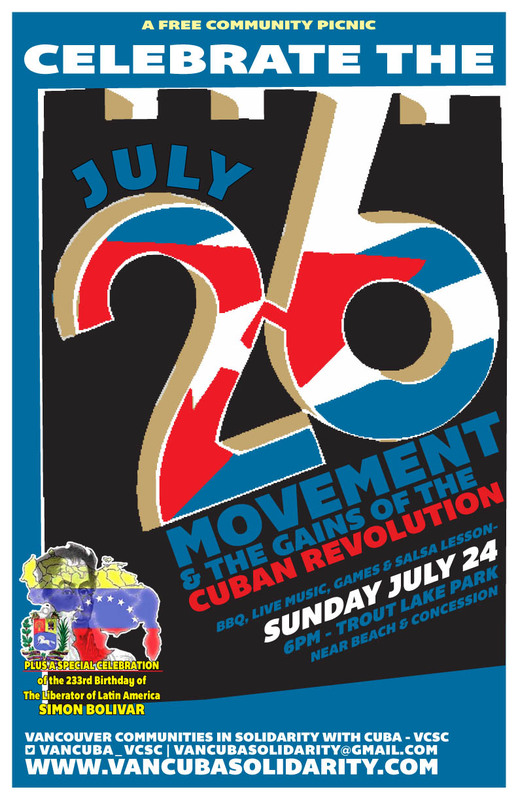 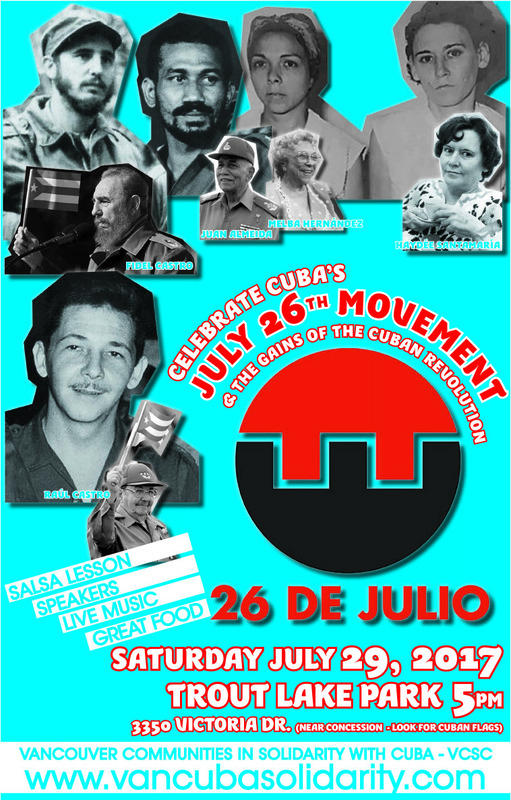 60 Years of the Cuban Revolution! 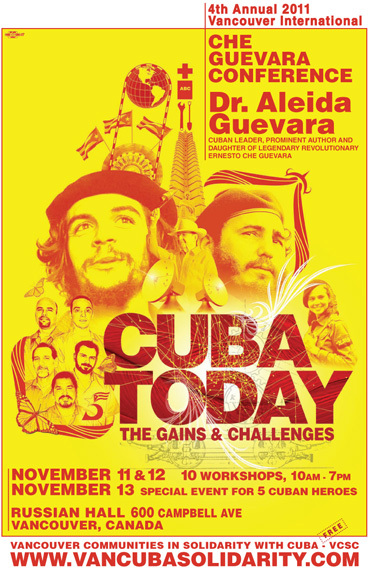 & the Gains of the Cuban Revolution! 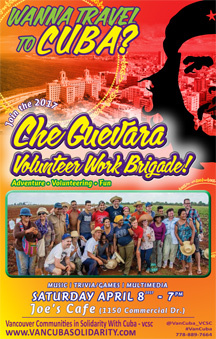 Guevara Volunteer Work Brigade to Cuba! 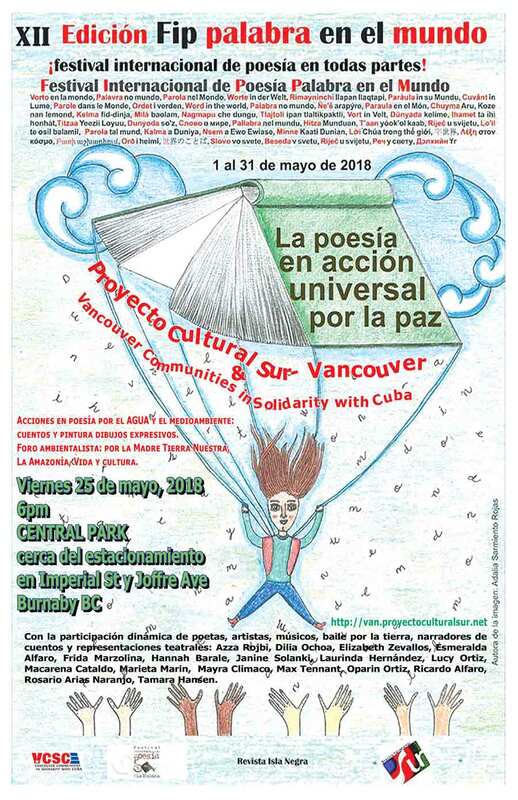 Palabras en el Mundo - Poetry Festival! 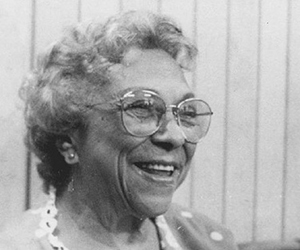 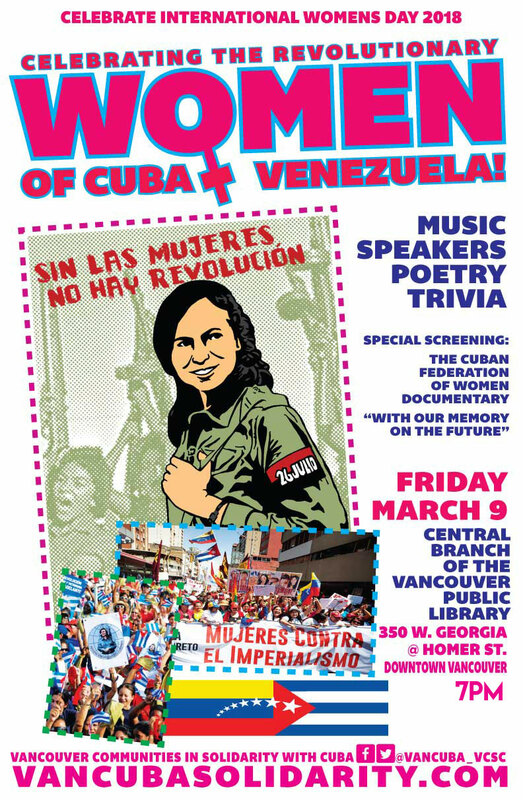 Celebrating the Revolutionary Women of Cuba & Venezuela! 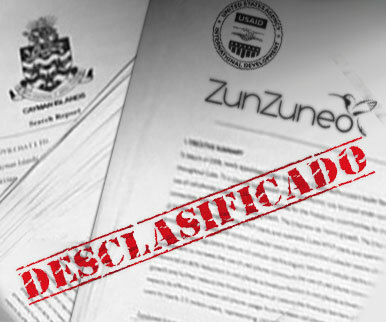 REPORT & PHOTOS COMING SOON! 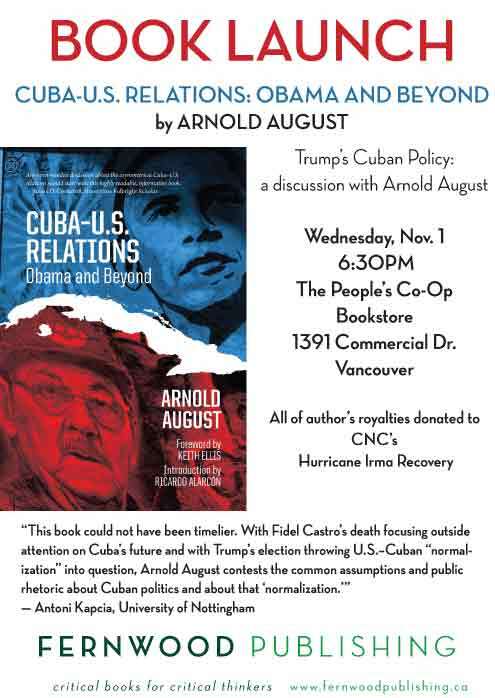 the U.S. Blockade on Cuba! 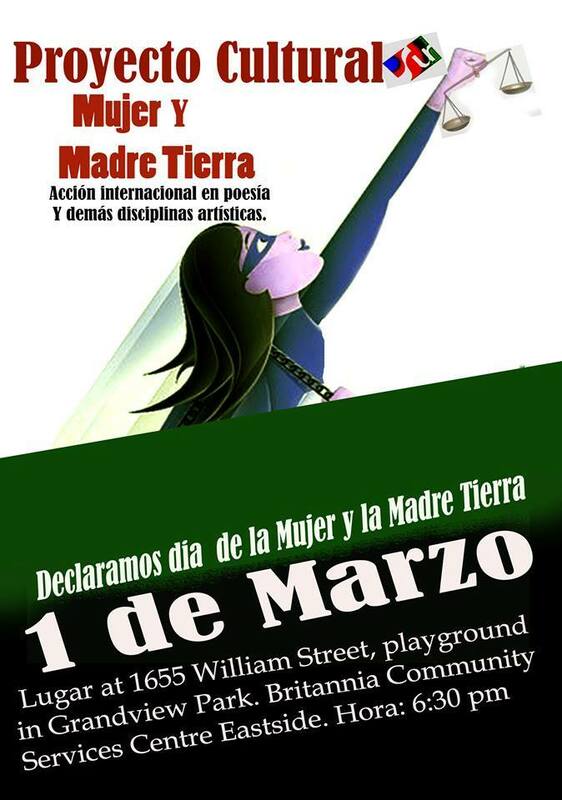 CLICK HERE FOR REPORT & PHOTOS! 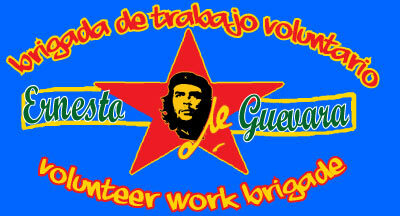 Che Guevara Volunteer Work Brigade! 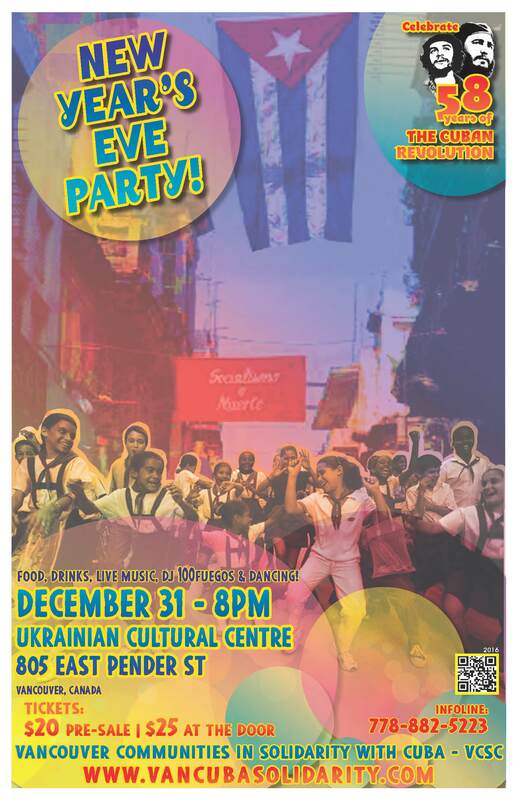 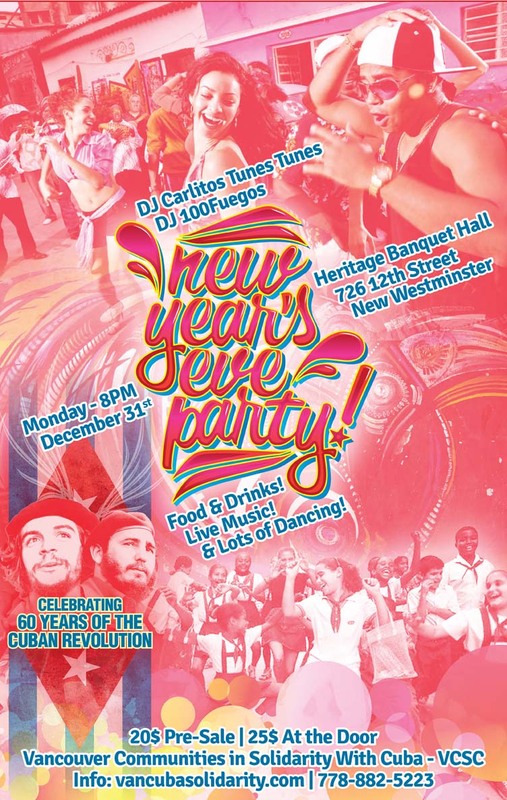 Cuban New Yearâ€™s Eve Party! 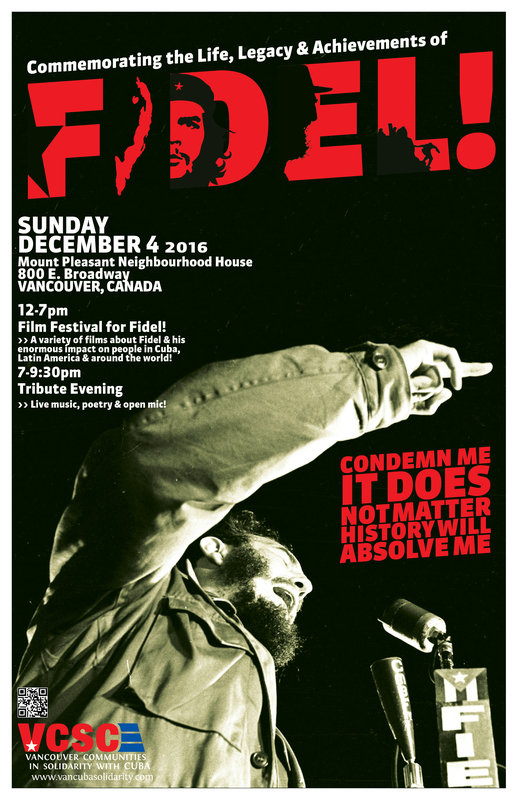 Viva Fidel! 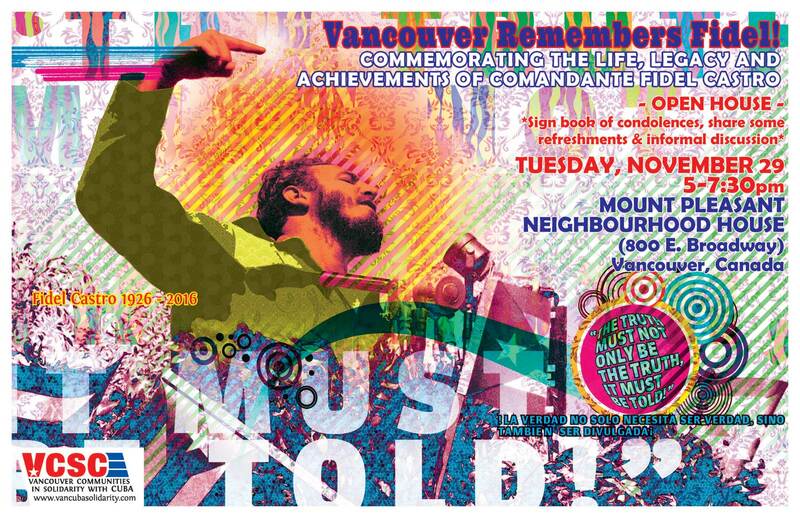 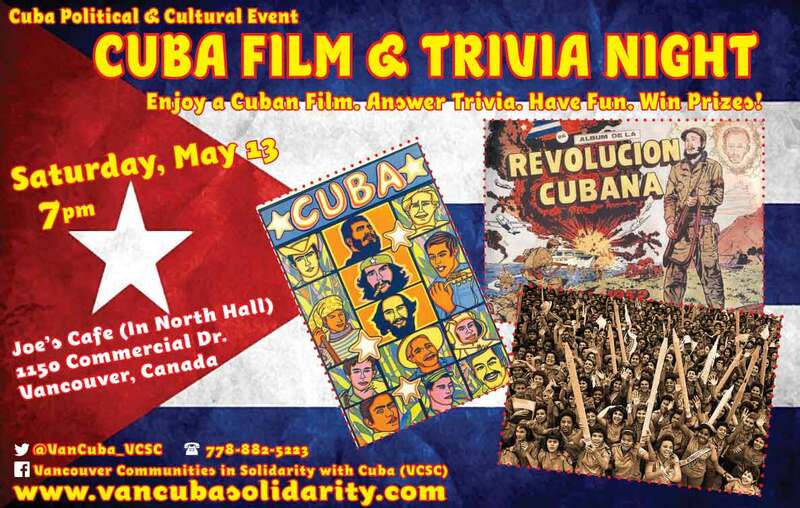 Film Festival & Tribute Event! 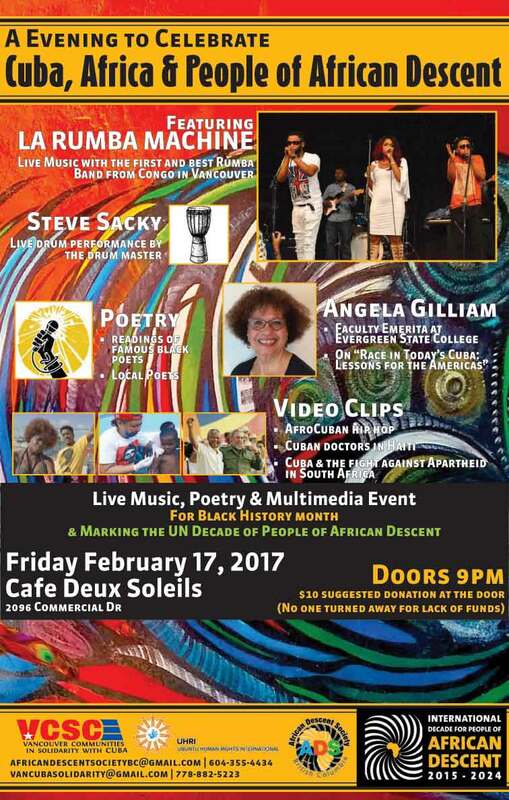 CLICK HERE FOR PHOTO GALLERY! 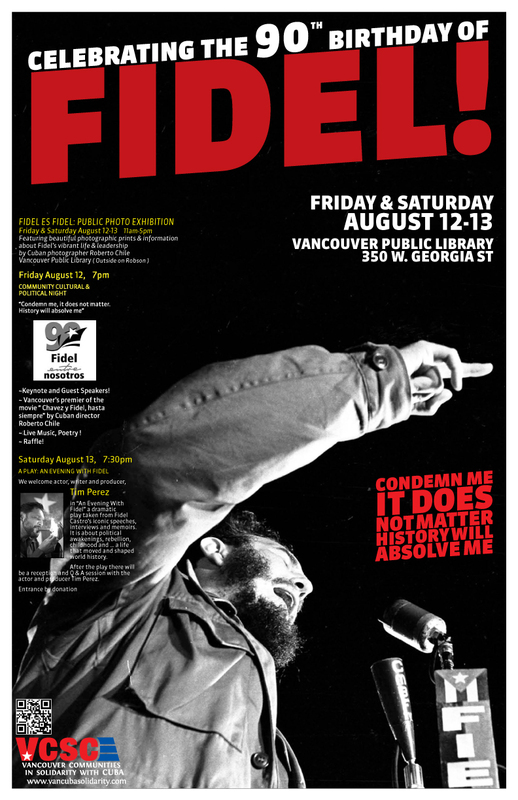 Celebrating the 90th Birthday of Fidel! 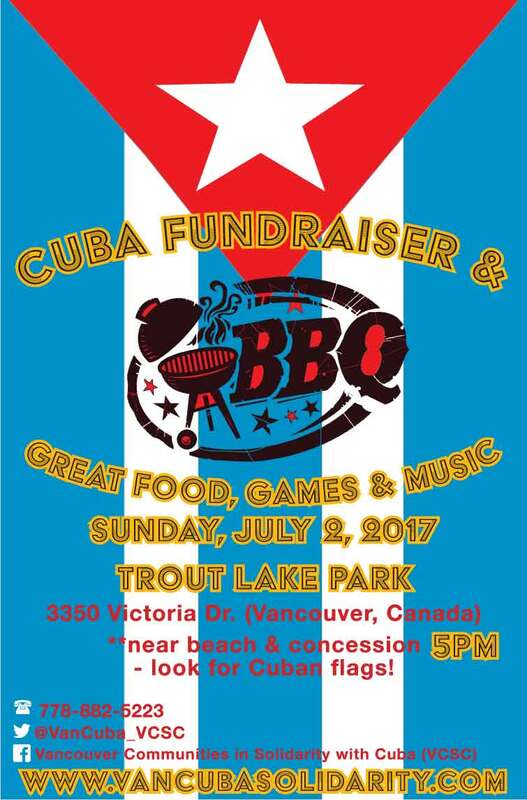 CLICK HERE FOR REPORT + PHOTOS! 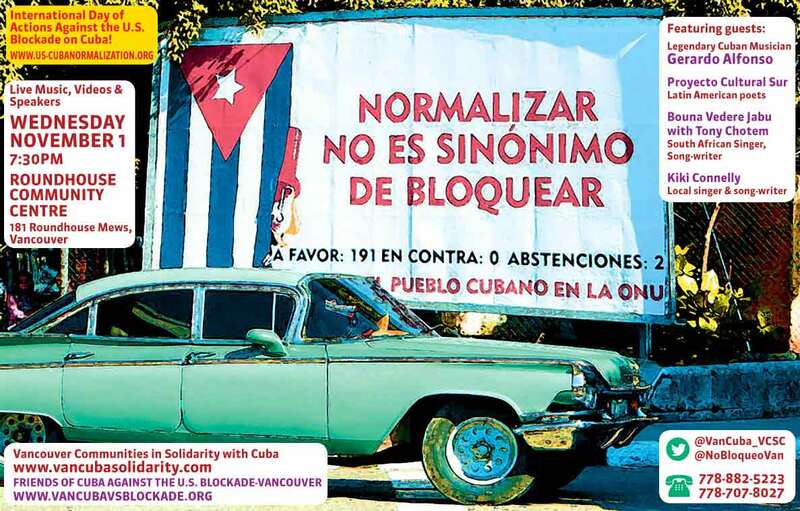 Now is the Time: End the Blockade on Cuba! 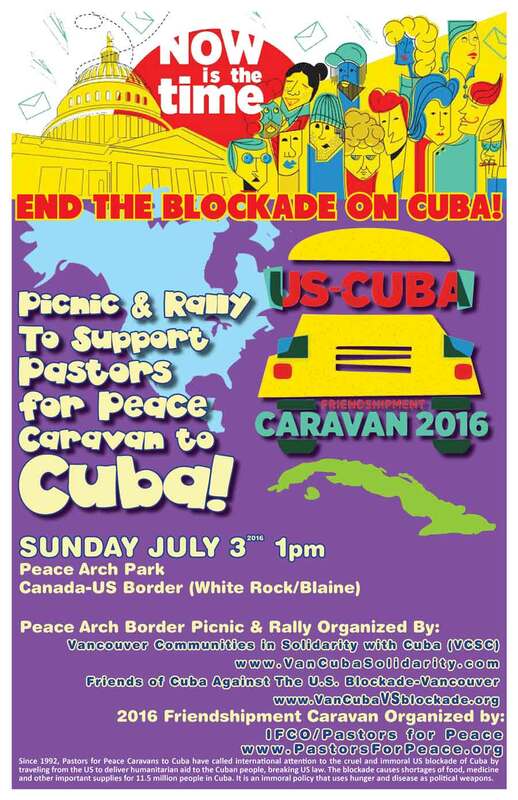 To support the Pastors for Peace Caravan to Cuba! 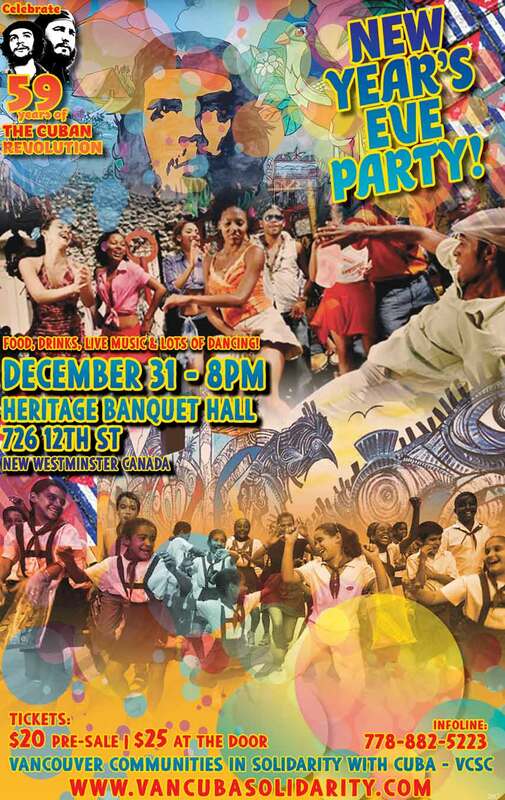 Click here to view the written report and photos! 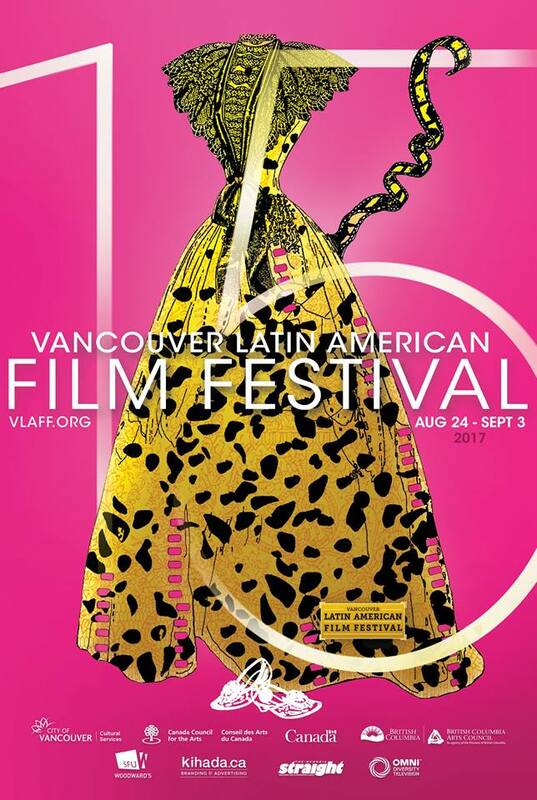 by Working TV in Vancouver BC! 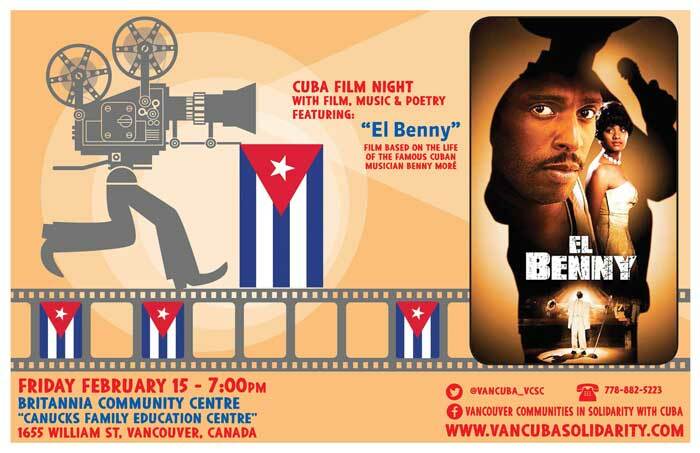 Tamara Hansen, coordinator of Vancouver Communities in Solidarity with Cuba (VCSC), was one of the invited guests on the national nightly CubanTV show 'Mesa Redonda'. 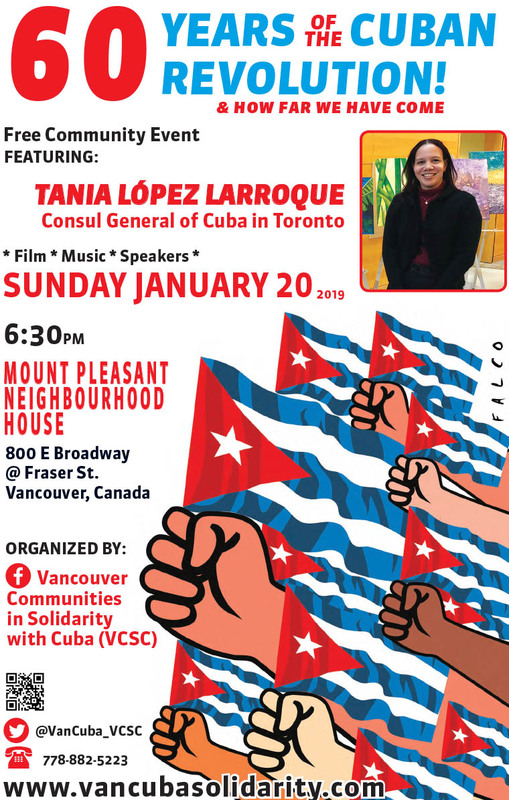 Tamara spoke about the campaign for the freedom of ALL the Cuban 5 in Canada and the ongoing work of VCSC and the Free the Cuban 5 Committee-Vancouver . 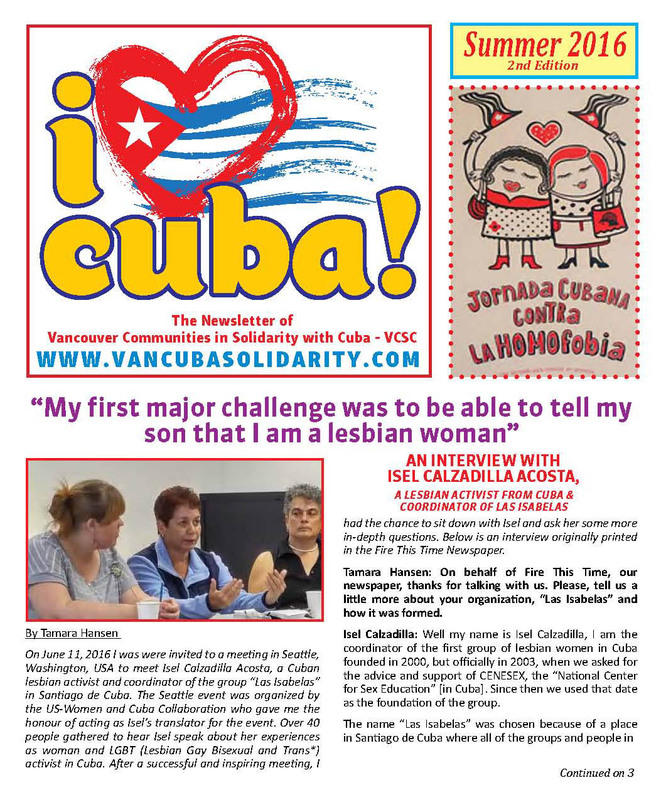 VCSC calls on all individuals and organizations with an interest in defending Cuba to come together in defense of Cuba to build a movement united with Cuba, with each other, and with all oppressed people worldwide against imperialism. 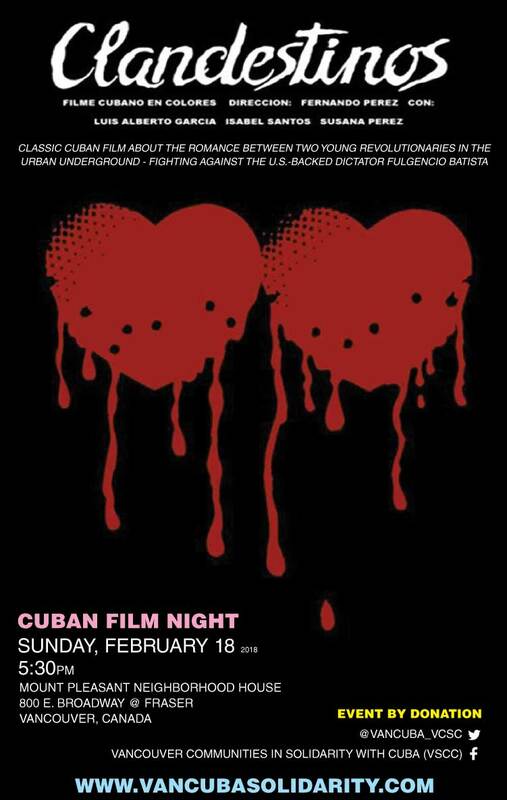 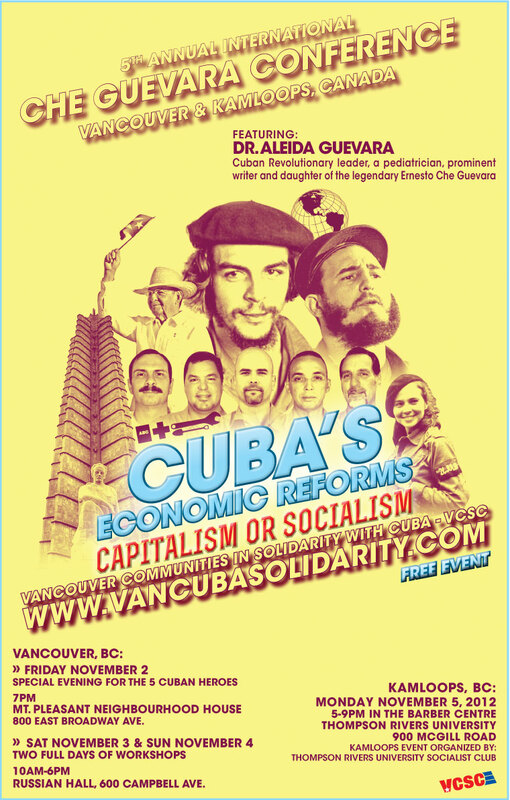 We hold bi-weekly meetings open to anyone with an interest in Cuba solidarity work. 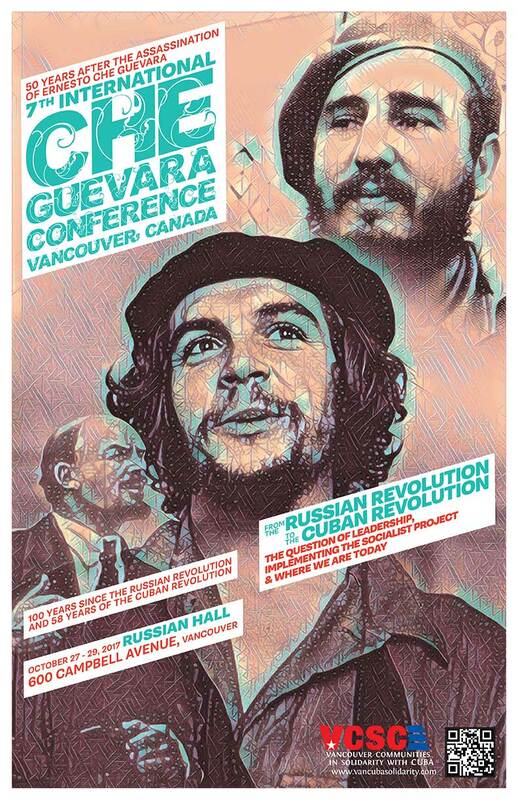 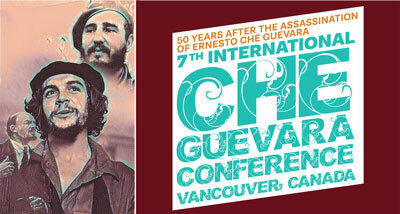 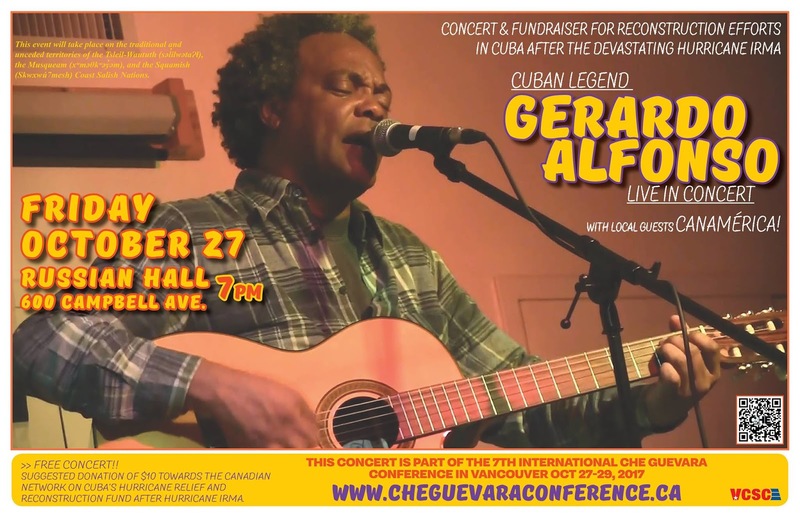 7th International Che Guevara Conference! 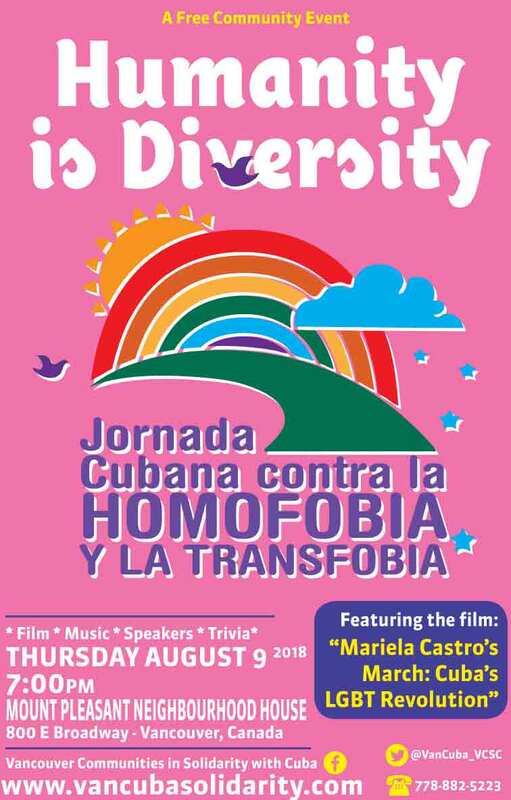 Click here for the Report & Photos! 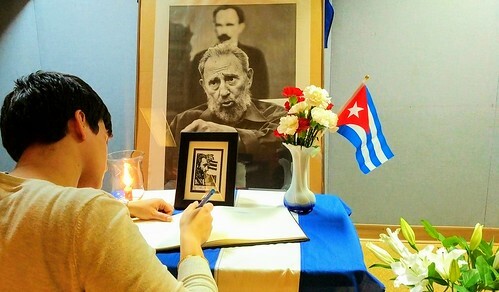 El Legado de Fidel Castro Vive! 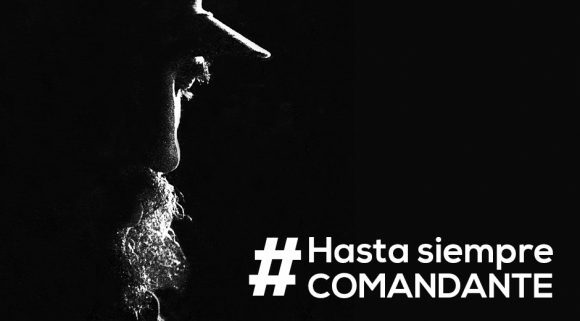 After 7 years of harassment and intimidation at the hands of the Internal Revenue Service, the Interreligious Foundation for Community Organization (IFCO) has been informed it will be stripped of its tax exempt status for its humanitarian work in Cuba â€” unless we act now! see below for information on two exciting Cuba solidarity tours! 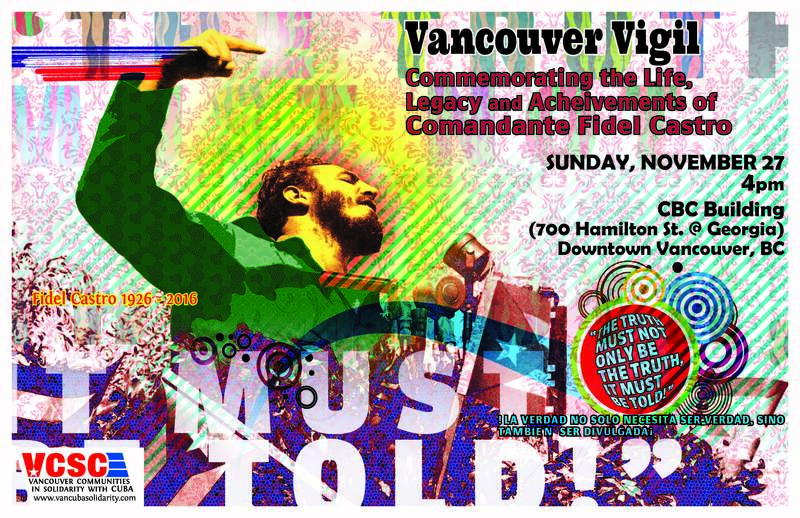 VANCOUVER CELEBRATES WITH THE WORLD THE RELEASE OF THE CUBAN 5 HEROES! 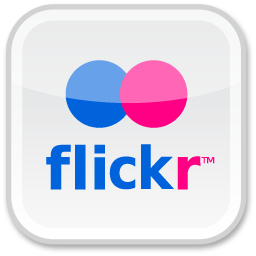 Click here to View More Photos on Flickr! 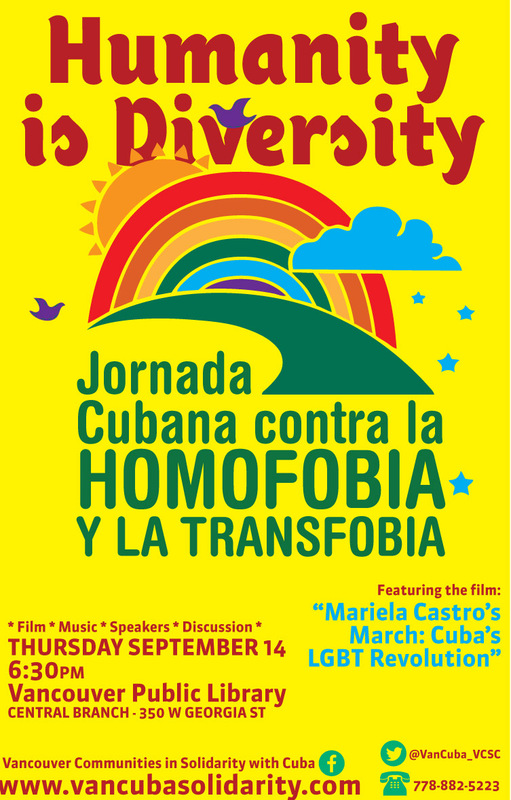 THE CUBAN 5 HEROES ARRIVING IN CUBA! 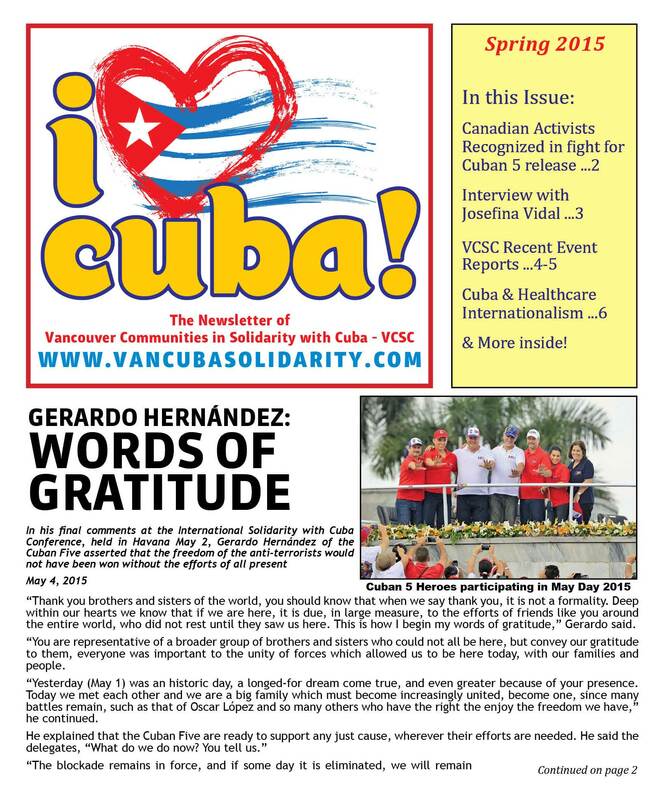 Click here to see photos of the Cuban 5 with their families in Cuba! 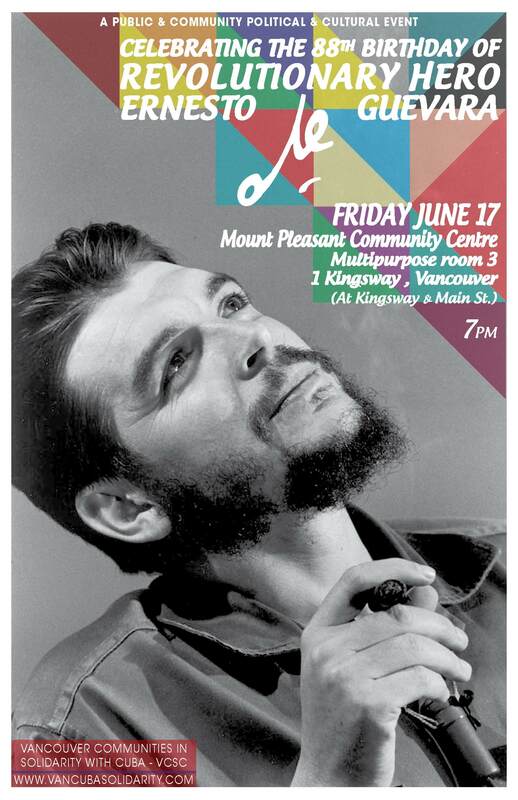 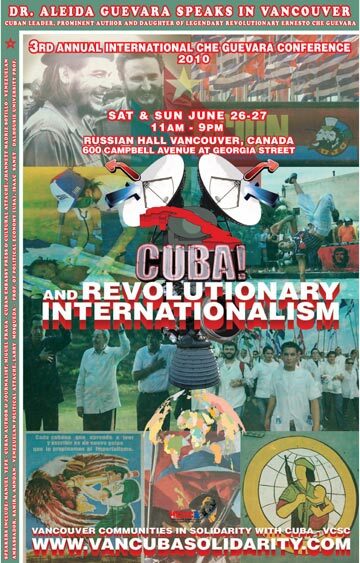 Cuba Present in the 2014 Vancouver Pride Marches and Festivities! 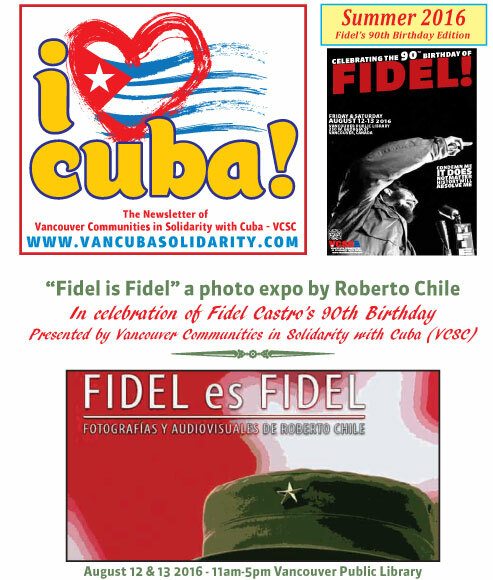 "5 Days for the Cuban 5"
Click Here to View Photos on Flickr! 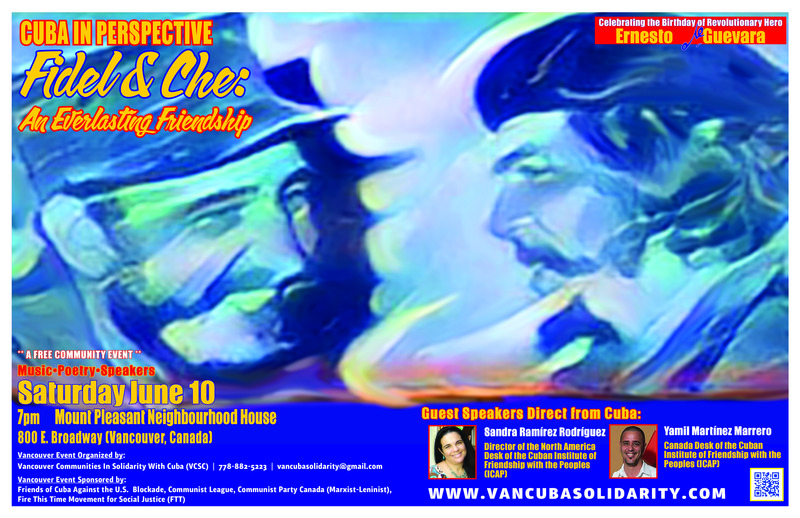 There was the opening two-day conference focusing on the future of US-Cuba relations and featuring participants from around the worldâ€¦ a kick-off press conference at the National Press Club that generated interviews with the Washington Post, NPR and CCTV, not to forget lots of coverage in international mediaâ€¦ a concert headlined by the well-known political hip hop group Dead Prezâ€¦ a Saturday morning bicycle tour of Washington monuments by more than 25 delegates from Vancouver and elsewhere â€” their bikes festooned with â€œObama, Give Me Five!â€� posters â€” who arrived at the White House en masse just as the main demonstration beganâ€¦ that 500-strong demonstration and march from the White House to the Justice Departmentâ€¦ two intense days of lobbying more than 60 members of Congress by representatives of community, legislative and human rights groups from 31 countriesâ€¦ and even two meetings with senior State Department officials whoâ€™d never deigned to respond to requests for meetings in the past! 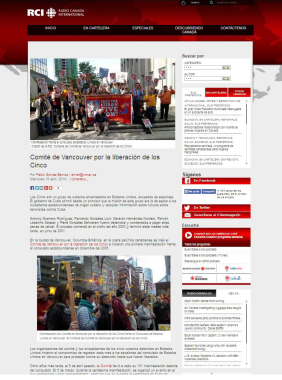 Vancouver's Monthly Picket for the Cuban 5 featured by the Juventud Rebelde Newspaper in Cuba! 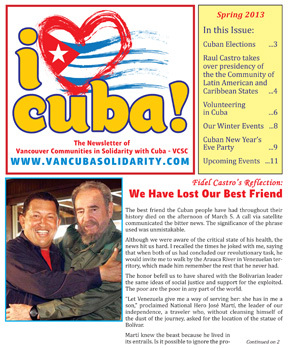 Piquete Mensual de Vancouver para los 5 Cubanos ofrecido por el periÃ³dico Juventud Rebelde en Cuba! 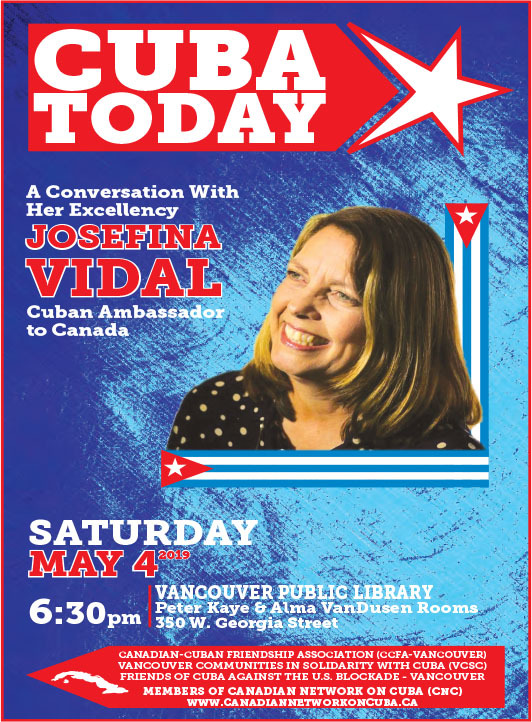 8 Events in 4 Days for the 5 Cuban Heroes â€“ West Coast Tour Featuring the Cuban Ambassador to Canada and Author Stephen Kimber a Great Success! 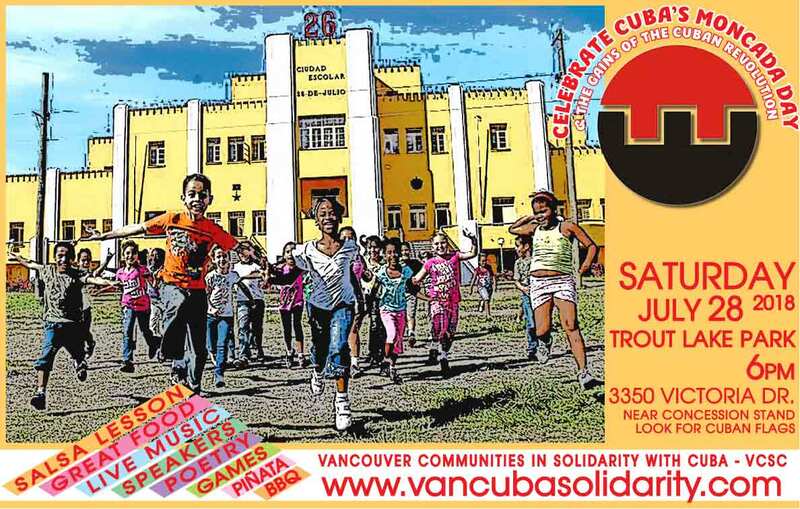 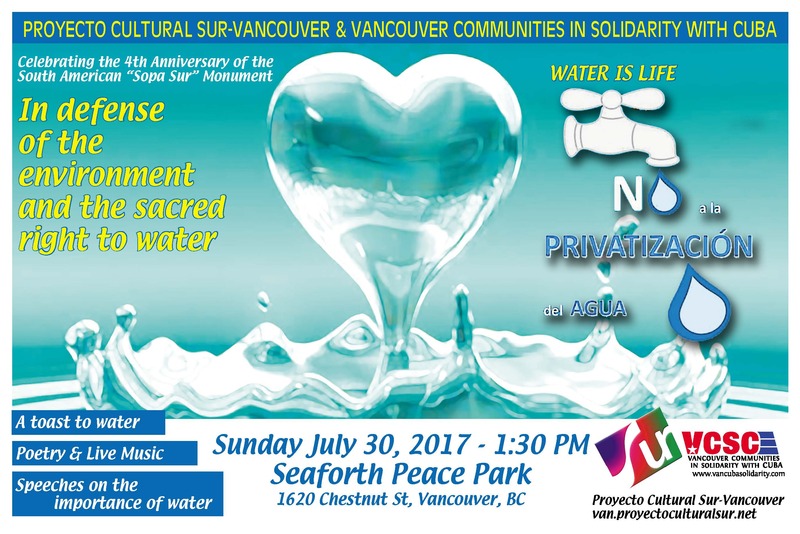 8 More Solidarity Events Across Canada and Internationally Make 16 Events in Total! 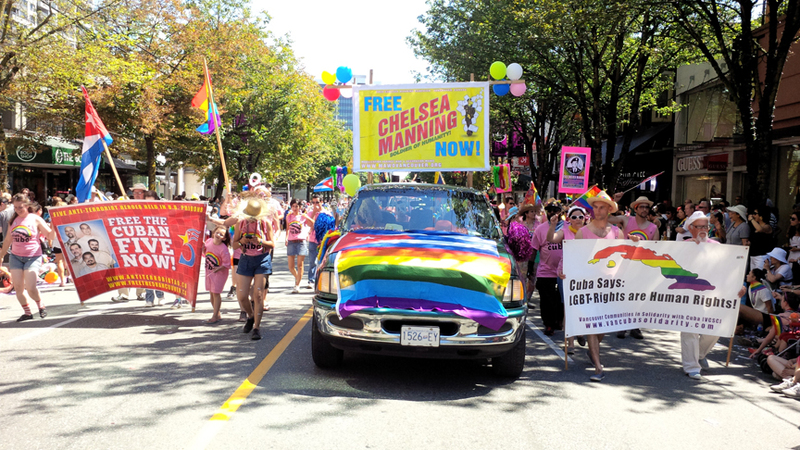 CLICK HERE FOR PHOTOS & REPORT! 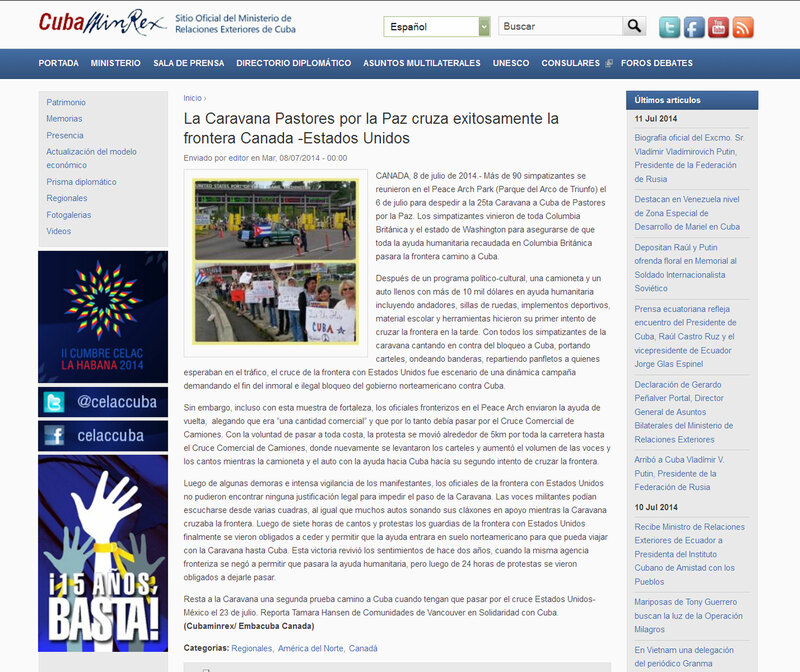 HAGA CLIC AQUI PARA VER REPORTE Y PHOTOSl! 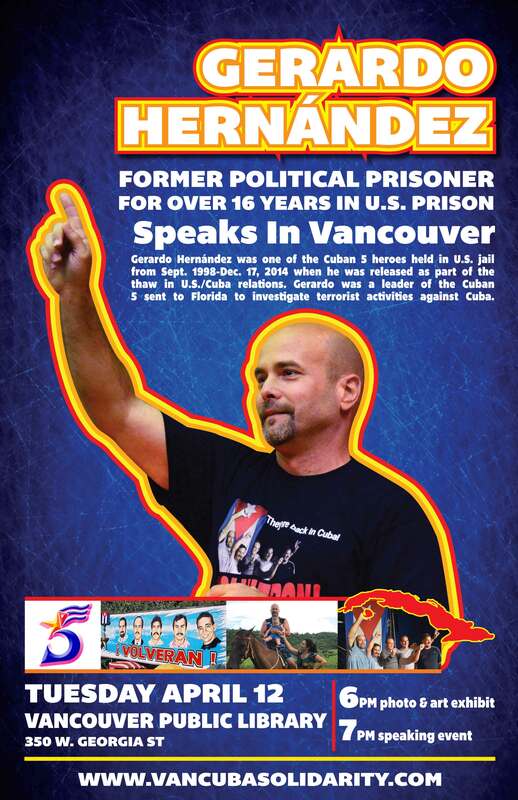 On February 27 2014, Cuban 5 Hero Fernando GonzÃ¡lez was released from U.S. prison after serving an unjust sentance of over 15 years. 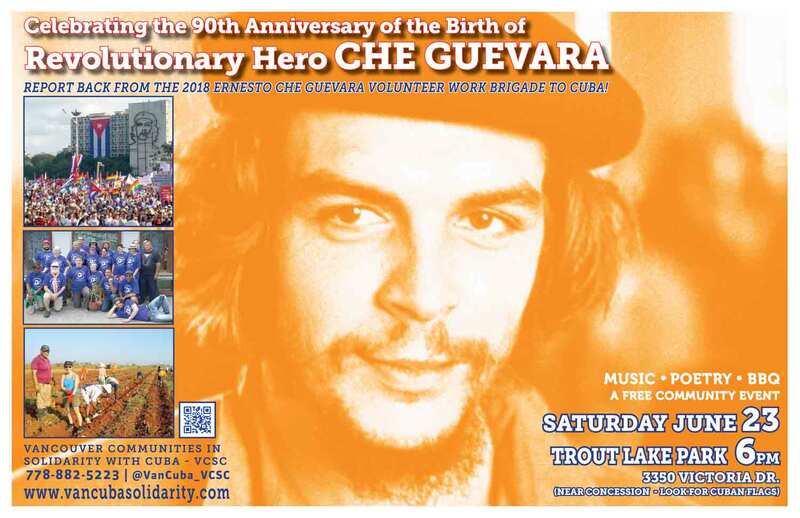 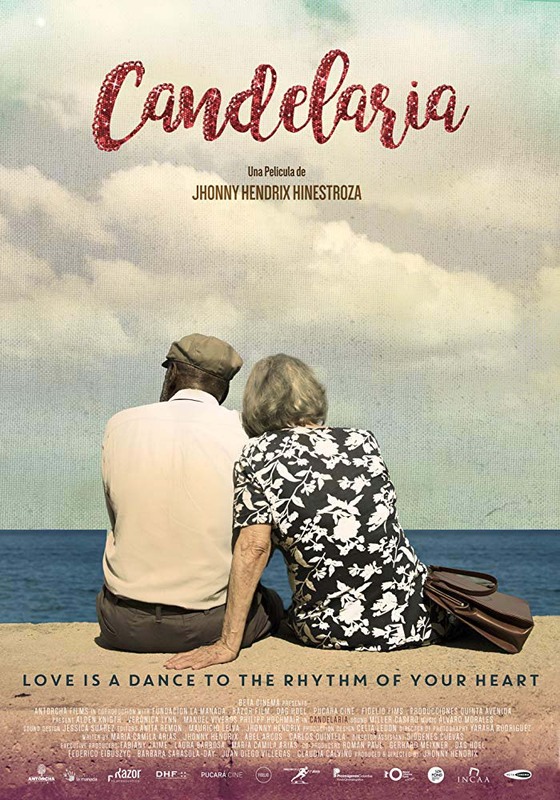 On February 28th 2014 he returned to Cuba to his family and his people. 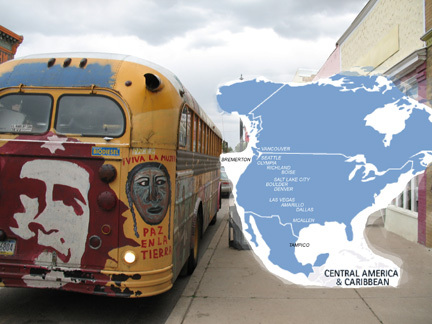 This is a grat step forward in the campaign to Free the Cuban 5 Heroes and now is the time to increase our efforts so that Gerardo, Antonio and Ramon are also freed and at home in Cuba with their loved ones. 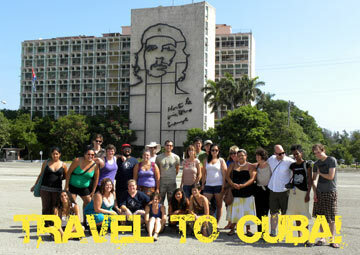 Click here to see photos from Fernandos arrival in Cuba! 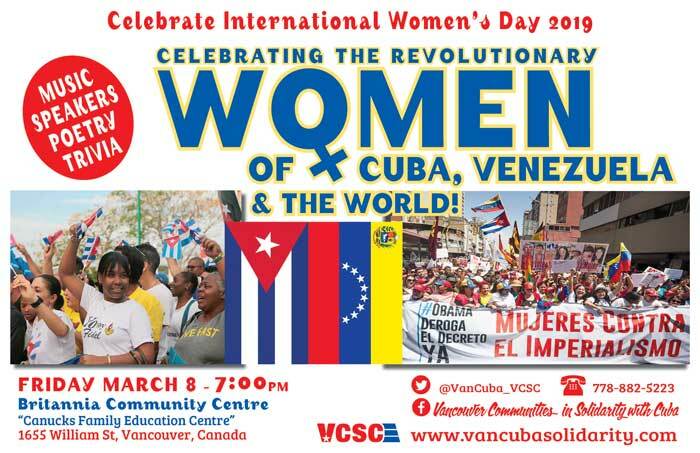 WE WANT TO SEE MORE YELLOW RIBBONS EVERYWHERE!